150 volunteers, 8 community groups, 3 beaches, 5 inland parking lot and street areas cleaned. Call to action for groups and families to adopt a needy place. 353 volunteers involving 22 community groups cleaned 6 beaches, 3 rivers, 10 streets and conducted 1 gardening project. Tote bags are distributed to reduce plastic bags in the waste stream. 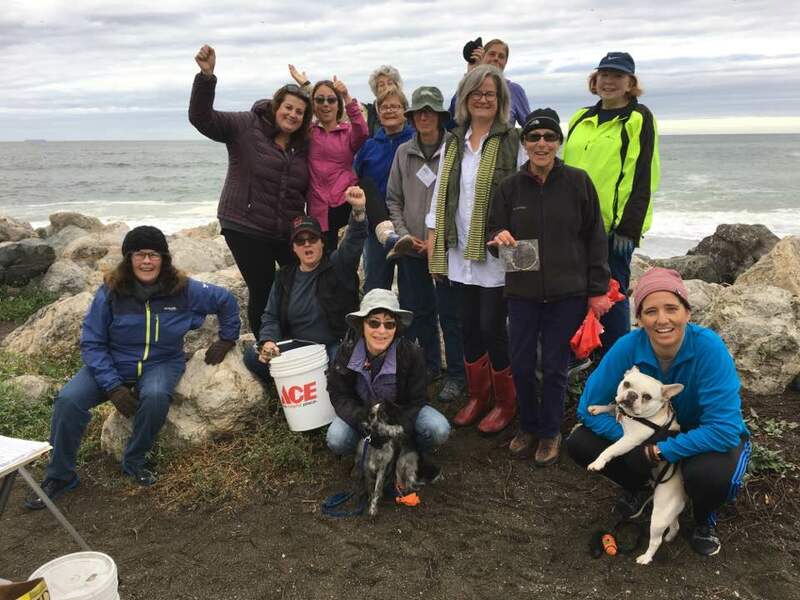 600 volunteers involving 45 community groups, 13 businesses and the city of Pacifica had 30 projects including 6 beaches, 20 streets, 3 bluffs, 2 parks, 5 creek areas and 6 habitat restoration projects. EcoFest added with food, speakers, and awards. Reusable water bottles distributed to minimize plastic bottle use. 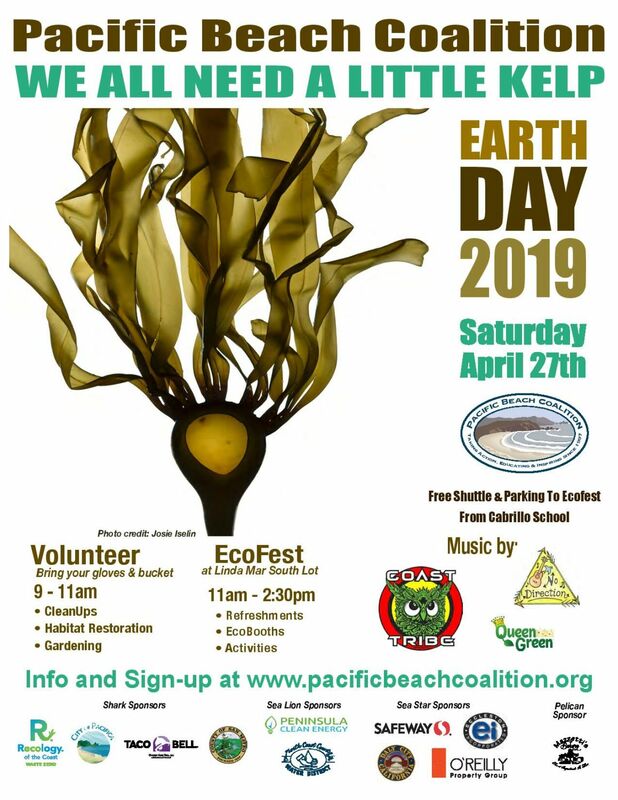 1500 volunteers, 65 community groups, 55 businesses and the City of Pacifica cleaned 97 sites, 5 beaches, 25+ streets, 6 bluffs, 5 shopping centers, 2 parks, 4 creek areas, 4 schools, 5 childcare centers, and 8 held habitat restoration/garden projects. Bandannas distributed to educate on Pacifica’s watershed and pollutants we can reduce. 3744 volunteers, 95 community groups, 58 businesses, 6 school wide events, 20 yard dumpster of trash, 3 pickup trucks of recycling, 4 trees planted, multiple habitat restoration projects. Tote bags distributed. Students received watershed posters. 10 sites outside of Pacifica participate. The Water District is our partner to focus on water conservation. Event is dedicated to Steelhead trout in our San Pedro Creek and off our coast, tying into the water drawn from Hetch Hetchy Reservoir, rivers and streams throughout California and pollution entering the ocean from our streets and beaches. 6000 volunteers, 100+ community groups, 102 businesses, 10 school-wide cleanups, 85 locations, 17 trees planted. Dedicated to Brown Pelican nearly extinct 40 years ago during 1st Earth Day. 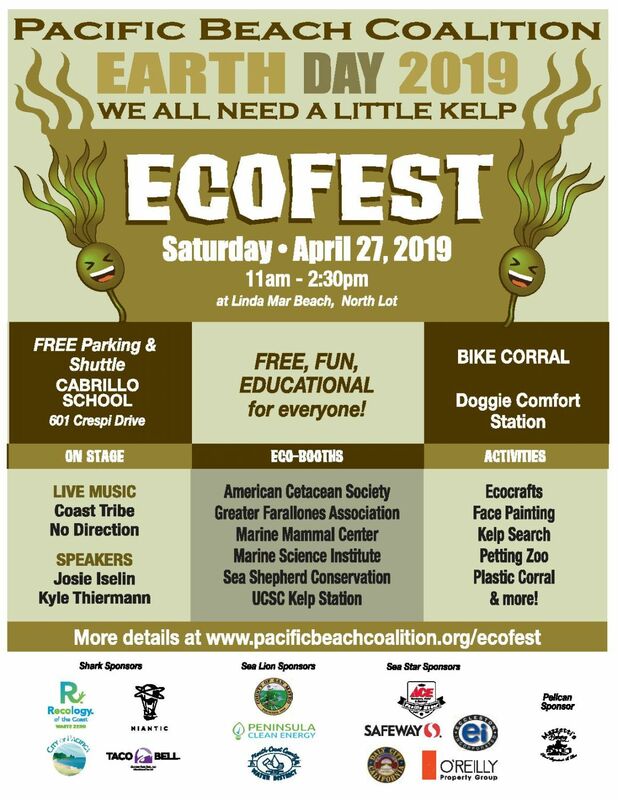 EcoFest moves to Linda Mar State Beach. Jackie Speier is our guest adding EcoFest into Congressional record. Distributed Earth Hero buttons, BPA free aluminum water bottles, stainless coffee tumblers & Safeway tote bags. 7200 volunteers, 100+ community groups, 100+ businesses participated. 6000 students make pledge and take school-wide action. 8300 lbs of green waste including non-native Pampas Grass removed. 3 trees planted. Dedicated to California Gray Whale which has longest migration of any marine mammal. EcoFest held at Linda Mar with 25 booths & music. Distributed pencils, Earth Hero buttons, biodegradable dog bags and pocket ash trays. 8100 volunteers, 100+ community groups, 100+ businesses participated. Groups connected to expand projects. School assemblies educated and inspired students. Dedicated to Sea Turtles to establish Leatherback Sea Turtle off our coast as the State Marine Reptile. EcoFest hosts 30+ booths, kids activities, and 2,000+ visitors! Terra Nova HS had over 300 volunteers. J Nichols, Turtle Expert Chris Pincetich, and Supervisor Don Horsley toured projects. Jerry Hill and Jackie Speier are guests. 8531 volunteers, 150 community groups, 125 businesses, 12 school assemblies, VIP tours, EcoFest draws 2,000+ attendees with 40+ booths, circus, 3 bands, volunteers pick up 30% less trash by weight, and remove more greenwaste. We learned about Sharks, our honoree, from Expert David McGuire. Pacifica Tribune special edition Earth Day followup is spectacular! In addition to 4500 students attending school assemblies, the 10th Anniversary of Earth Day of Action & Ecofest brought together more than 7200 volunteers, and honors threatened western snowy plover with annual eco-theme “Little Things Matter,” focusing on little pieces of litter harming our environment, and the small, but powerful actions Earth Heroes can do daily to make ‘Every Day Earth Day.’ Volunteers take annual pledge to protect the environment. Litter and invasive weeds removed to make way for native habitat plantings. Broadcast and internet radio campaign delivered eco-friendly messages worldwide. Distributed reusable stainless double wall insulated water bottles and coffee tumblers, Earth Hero buttons and coastal stewardship pledge bookmarks. Jerry Hill honors Earth Heroes. More results about Earth Day 2014 here. More results about Coastal Cleanup Day 2014 here.